Are you an experienced hardgainer whose workouts have stalled? It is tough when you start to see your gains dry up. It can sap your motivation and make going to the weightroom seem like drudgery. If you are an experienced lifter whose progress has stalled, just know that we have all gone through this. Plateaus are no fun, especially when they seem to last for months. Before we go any further, I want you to know there is no "magic formula" for getting out of this funk. What works for one guy, may not work for us. Advanced workouts require even more focus on diet, as well as being even more purposeful in the gym. Problems arise when guys get so frustrated, they start listening to anyone in the gym, or go to a muscle magazine and read what the "Pros" (steroid juiced to the gills) do. * Any kind of "blitz" focusing on one muscle group, such as the "5-day Bench Blitz" or the "5-day Curl Blitz". These are recipes for tendonitis injuries. * Purchasing expensive "secret high-tech" supplements. Advanced muscle building workouts require some experimentation, but you do NOT need to change everything all at once. Positive change takes place over several weeks, not several workouts. The stronger you are, the more slowly growth in strength and lean muscle will come. This is why NFL players and Olympic athletes understand that reality means they can only gain about 1 to 1-1/2 lbs of rock hard muscle in an entire month. However, just because I have had success with this does not mean anyone else will. It is just to be used as a guide for your own experiments. Brad Pilon, the author of the hugely successful Eat Stop Eat fat loss program has now come out with a mega-selling program for advanced lifters. His Anabolic Again Advanced Workouts is designed specifically for hardgainers who are experiencing hormonal slowdown and have stalled in their strength/lean muscle gains. * Have been using the SAME weights during their workouts. * Have NOT gained muscle in at least a year. * Have tried dozens of tweaks to get off the plateau. * Have increased their calories, but only put on belly fat. * Feel lethargic instead of jacked-up when they head to the gym. 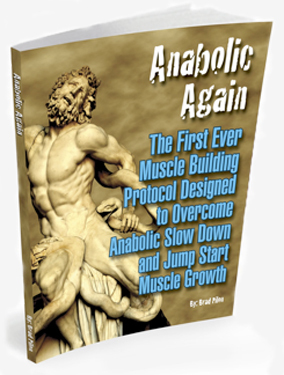 Anabolic Again Advanced Workouts is unconventional and only geared to a small segment of guys who train. If you have been looking for advanced muscle building workouts that get results, Brad's proven program will be worth considering. Some readers are hesitant because of the price of Brad's program. If you would like to start with a less expensive advanced muscle building program, Jeff Anderson's Optimum Anabolics was the leader for advanced lifters before Brad's program hit the market.